Home > Kline > Why Forced / Closed? Why has my channel been closed / forced +s ? If your channel has been closed, it most likely is due to a failure to comply with the Acceptable Use Policy (AUP). Prior to contacting the Kline/Close Team, please review the AUP, so you are familiar with it. Inactive channels which are not registered and occupied by a channel-holding bot are closed and will not be reopened. Channels created for the purpose of harrassment of other channels or users will be closed. Channels may not be "held open" by a bot. It is encouraged that if you wish to have a bot in the channel, the bot parts the channel after 5 minutes, when no members of the channel are present. Please read the AUP in regards to this. Channels which are Forced to secret mode (+s), more than likely contain inappropriate topics, or a Channel name that is not rated PG. This is a family network, and therefore if a Founder registers a channel, it is his or her responsibility to maintain a clean topic, or to set his/her room to secret. If this is not done, an oper will enforce it and this cannot be removed unless through reporting to this team. 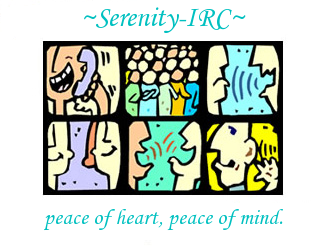 Email these details to the Kline/Close team at kline@serenity-irc.net. By submitting your inquiry to the K-Line/Close Team for information on a kline/akill or channel closed/forced +s, you are ensuring you understand and are in agreement with the Serenity-IRC Acceptable Usage Policy. Merely contacting the K-Line Team does not mean that a kline or akill will be removed, nor that a closed channel will be reopened or the forced +s will be removed.